I would like to speak from my heart today. 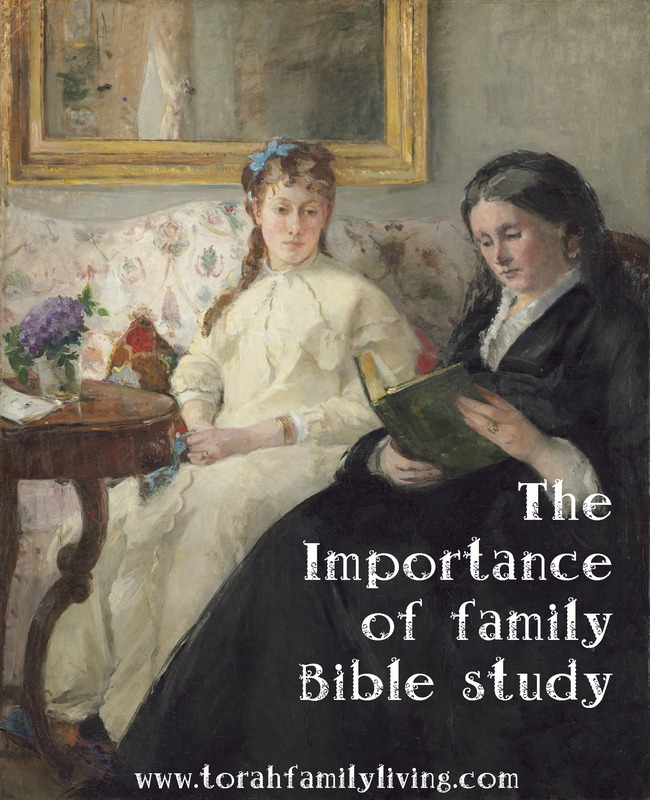 We have been working really hard to have an evening Bible study time together as a family every night. We have learned a lot about being faithful and consistent, about learning together, and about the Bible. Today I want to share with you some of what we have learned in the hopes that you will be inspired to get together every day and study as a family. You can download this post as a podcast here. 1 We learn more about the Bible. 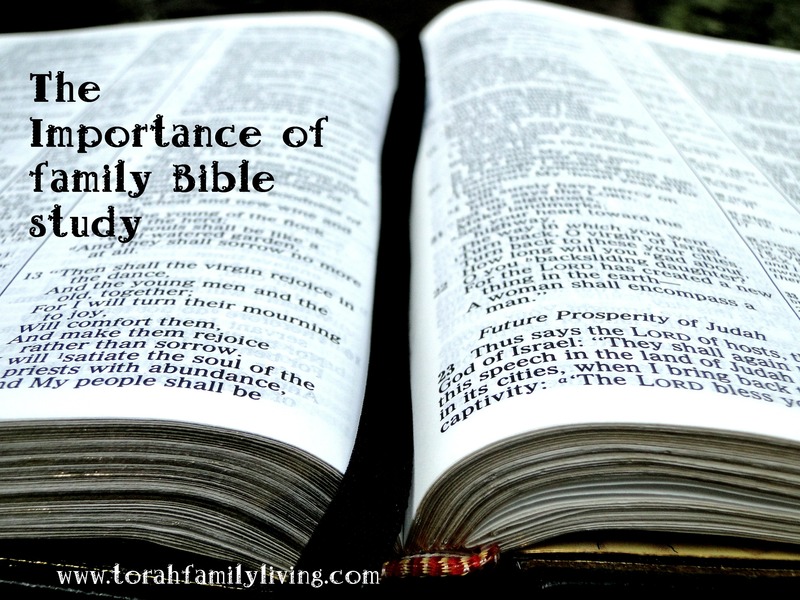 We study the Torah portion every Shabbat with our children, and have for several years. I am so pleased when my children can finish the story, because they have become pretty familiar with the stories at the beginning of the Bible. During the week, my goal is to teach them the rest of the Bible. Our evening Bible class has been a wonderful opportunity to do just that. This year, we are working our way through the Old Testament, and are currently in the book of Judges. Do your children know the story of Ehud? It’s pretty cool, and you can read about it in Judges 3. Anyways, make sure your children are learning the whole Bible, since Torah is the foundation of the building, and the rest of the Bible is the rest of the house. Make sure they are fully equipped by teaching them the whole book. There are plenty of ways that you can go about this awesome task. You can read it aloud and discuss it. You can never go wrong with simple. This is a great way to work through a book of the Bible. You can use a guide, such as Picture Smart Bible, (affiliate) our current study guide. It has your children drawing full page summaries of each book as you learn. It’s a great way to keep everyone engaged in the learning. You can also use coloring pages as you read to keep everyone on target. Get a free Shema coloring page here. You can listen to the Bible together. We have enjoyed using Faith comes by hearing. You can copy verses together. Try working through whole passages, like Exodus 20 or Psalm 119. No matter what approach you choose, I highly recommend that everyone have a Bible study notebook. Ours has blank paper and the coloring pages that go with our Bible study. Everyone knows to show up in the living room after dinner with their notebook and their Bible. Be sure that everyone has a Bible, too. My older children have a beautiful illustrated ESV Bible, and the younger children have picture story Bibles. Even Caleb (21 months) has a board book. This helps everyone feel involved in this special time. 2 We learn about good habits. Habits are inevitable. The problem is that we usually have bad habits and don’t even know where they came from. How do we go about uprooting the bad habits and replacing them with good? We’ve heard that if you can faithfully perform your habit for 21 or 30 days, then you are well on your way to a firm habit. I would like to add that habits are more easily formed as a group. There’s this thing called accountability. It works great on habits! I found that as we worked on having Bible class every night, if I forgot, someone else remembered. At least one child would be waiting on the couch with their Bible study notebook and Bible. We also created a checklist for the evening to help us remember each task, such as cleaning up the kitchen after dinner. Bible class is on that list so we won’t forget. Do whatever you have to in order to develop this amazing habit. 3 We have great spiritual discussions during our Bible study. I cannot begin to tell you how awesome it is to study and discuss the Bible together. Sure, some nights you wish you had glue to stick them in their chairs and a mute button for their mouths. Those are the tough days. But there are good days, too. Days when your children have great questions or incredible insights and you look at them in amazement. On those days, you realize that your children are getting it. They are learning about the Master of the Universe and His Word is finding its way into their hearts. It makes you feel better, even though they still struggle with spelling. Why? Because if they have developed a relationship with their Heavenly Father, the rest tends to take care of itself. And you realize that you have been chosen to be a small part of this amazing journey with your children. You are there when the light bulb goes on in their heads and they realize that they don’t need to be afraid of the dark because YHVH is there. You want to cheer when they see how people in the Old Testament tell us about Yeshua and His deliverance. You can’t help but be thankful that you are there to watch. Don’t miss this amazing time with your family. Study the Bible together every day, if you possibly can. 4 We are passing down spiritual blessings. As I mentioned before, we are in the book of Judges right now. As you may know, Judges repeats the same cycle over and over and over. The Children of Israel obey YHVH and are blessed. Life is good. Then they get wooed by other gods and serve them. They leave YHVH and do as they please. YHVH punishes them by making them slaves, etc. They cry out for deliverance and YHVH sends a judge, a deliverer. They repent and start following YHVH again. I asked my children what they thought caused this cycle to happen. It doesn’t make sense when you look at it straight on. But the answer is quite clear when we look at Judges 2:10. And all that generation also were gathered to their fathers. And there arose another generation after them who did not know YHVH, or the work that He had done for Israel. You see, the people in Joshua’s day served YHVH faithfully. They crossed the Jordan on dry ground. They watched as Jericho tumbled in front of them. They took part in victory after victory as they began the conquest of the land. They were blessed for all their days. But they forgot one important thing. They forgot to teach their children about YHVH. Let that sink in for a minute. How could they forget such an important thing? It’s pretty easy, actually. They got busy caring for their homes and families. They got busy with the work they needed to get done. They didn’t pay attention when their children asked questions about all the landmarks that Joshua erected. They assumed that their children would just have enough sense to worship the same God. But it doesn’t work that way. Children don’t learn about YHVH by osmosis. They don’t learn by accident. They don’t follow YHVH because their parents do. They have to each individually be introduced to their Maker. They have to be taught the Torah, YHVH’s rules for living. They need to be told about the Red Sea and Passover and Jericho and the poisonous snakes in the desert. They need to be reassured that YHVH is a strong fortress and a kind and merciful Elohim. They won’t learn this by accident. When we assume that our children will pick up our faith from our walk alone, we will be sorely disappointed. The book of Judges recounts how over and over and over, parents failed to purposely teach their children to follow YHVH. As a result, another generation rose up that did not know YHVH or His works on behalf of Israel. Parents, this has to be taken very seriously. You have to teach your children the whole Bible, the whole revelation of YHVH and His character and His work. You have to purposely and systematically and faithfully show up for this task. It won’t happen by accident. Choose today to protect your children from a faithless existence by teaching them every day. Once you have begun this important task of consistent Bible study with your children, begin to teach them the importance of teaching their children about YHVH. We must keep the chain going. No one can make assumptions on this one. No one can fall asleep at the wheel. Teach your children, and teach them to teach their children. This is how we will see blessings extended on our children’s children. Let it begin with you. Now that you can see the importance of faithful and consistent Bible study with your family, what step do you plan to take next? What can you do today to start forming this habit? I love this. I was reading the parable of the sower yesterday and what really stuck out to me when I read it this time was the seed that was choked out by life’s worries, riches and pleasure. All those things that can be great or stressful but can very much push YHVH out of first place in our life. Always keeping Him and His instructions for life first helps everything else sort itself out.